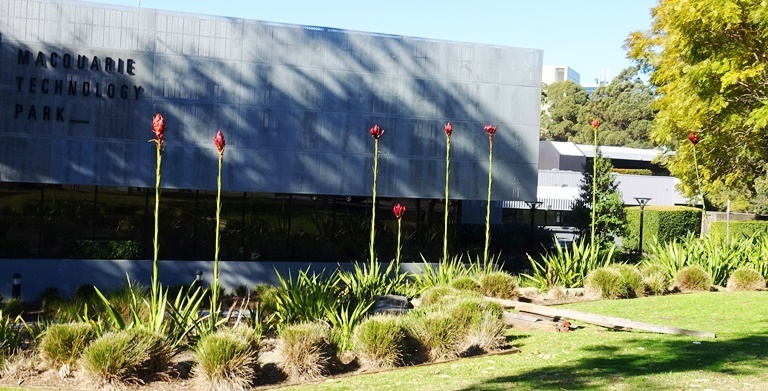 I am usually here in Sydney at the wrong time to see the gymea lilies blooming, but this year they are in full bloom. I usually see the gymea lilies after they have bloomed and are just a tall stalks or scapes with dead leaves on top of them. I think I may have some pictures, but they are not easily available tonight. These do look pretty spectacular lined up in front of the building our office is in. 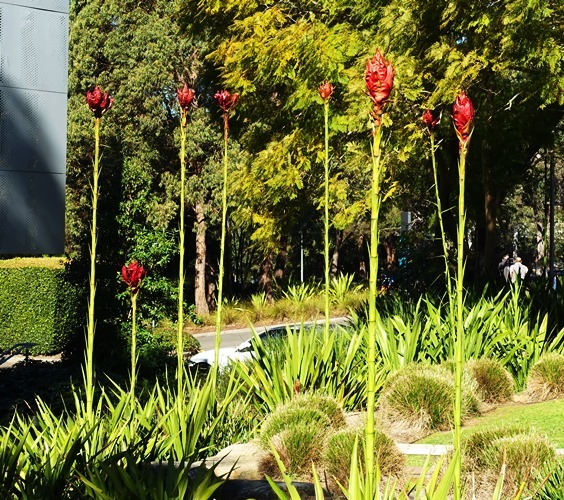 The gymea lily (doryanthes excelsa) scape can grow up to 20 feet tall and is topped with a beautiful red flower in the spring or late winter. Here is one of the scapes with a lily that is about to open up. you can see that it is very tall and reaches up along the tree. You can also see why these are also referred to as spear lilies. This lily is opening up, and has a nice background of the trees up above it. You almost get a sore neck looking at these flowers if you are standing by them. They are so tall. 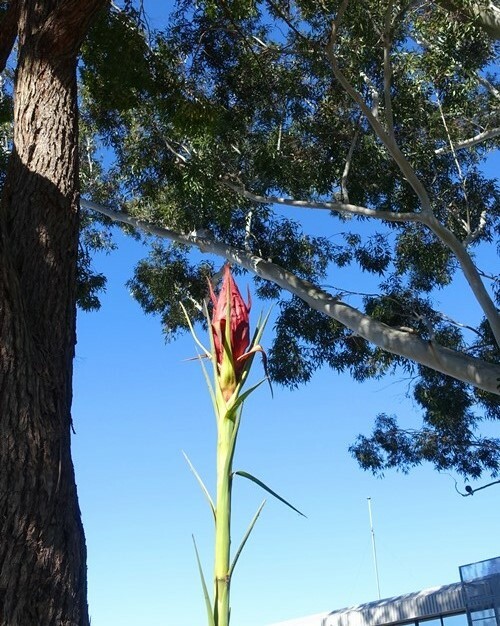 Here is a closer look at the gymea lily bloom. They have a very intricate pattern of petals. I plan on taking more pictures of the lilies over the next two weeks to try and get some better ones as these are some fantastic flowers. 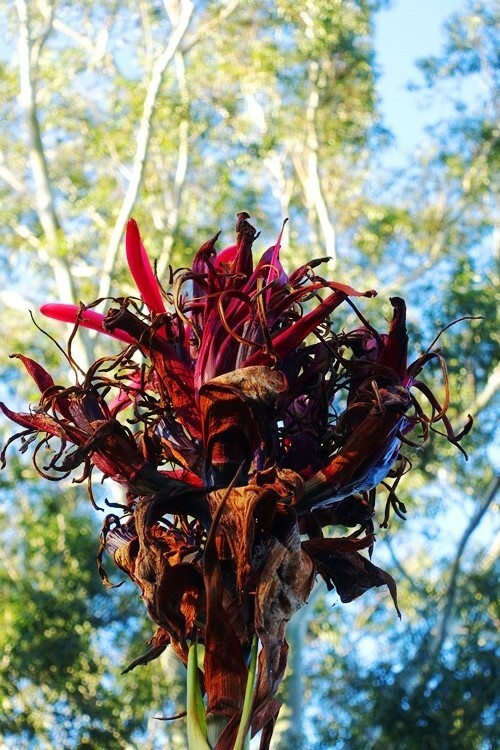 Have you ever seen a gymea lily? 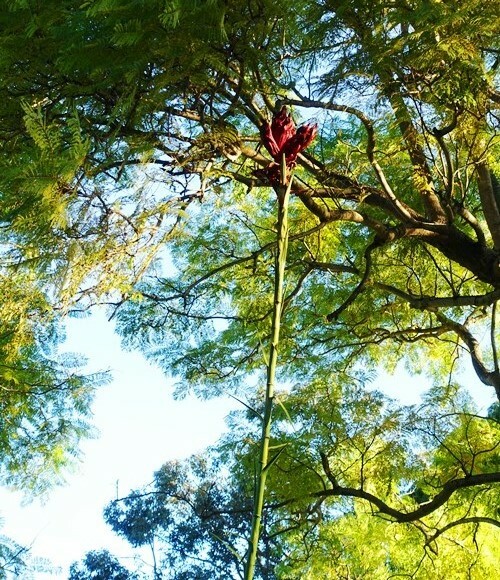 This entry was posted in Australia, Flowers, Nature, Travel and tagged doryanthes excelsa, Garden, gardening, gymea lily, lilies, New South Wales, scapes, spear lily. Bookmark the permalink.